What is the cheapest way to get from Carrickfergus to Newtownabbey? The cheapest way to get from Carrickfergus to Newtownabbey is to drive which costs £1 - £2 and takes 9m. What is the fastest way to get from Carrickfergus to Newtownabbey? The quickest way to get from Carrickfergus to Newtownabbey is to taxi which costs £16 - £20 and takes 9m. Is there a direct bus between Carrickfergus and Newtownabbey? Yes, there is a direct bus departing from Carrickfergus Joymount and arriving at Whiteabbey Northern Regional College. Services depart hourly, and operate every day. The journey takes approximately 23m. Is there a direct train between Carrickfergus and Newtownabbey? Yes, there is a direct train departing from Carrickfergus and arriving at Whiteabbey. Services depart hourly, and operate every day. The journey takes approximately 16m. How far is it from Carrickfergus to Newtownabbey? The distance between Carrickfergus and Newtownabbey is 6 miles. The road distance is 6.2 miles. How do I travel from Carrickfergus to Newtownabbey without a car? The best way to get from Carrickfergus to Newtownabbey without a car is to line 2 train which takes 16m and costs £4 - £6. How long does it take to get from Carrickfergus to Newtownabbey? The line 2 train from Carrickfergus to Whiteabbey takes 16m including transfers and departs hourly. Where do I catch the Carrickfergus to Newtownabbey bus from? 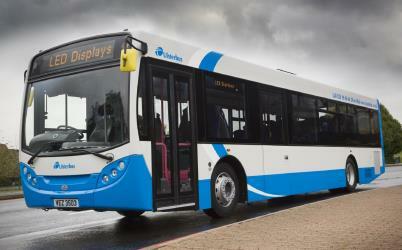 Carrickfergus to Newtownabbey bus services, operated by Translink UK, depart from Carrickfergus Joymount station. Where do I catch the Carrickfergus to Newtownabbey train from? Carrickfergus to Newtownabbey train services, operated by Translink UK, depart from Carrickfergus station. 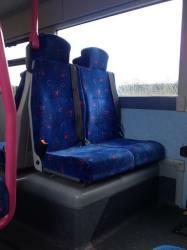 Train or bus from Carrickfergus to Newtownabbey? The best way to get from Carrickfergus to Newtownabbey is to line 2 train which takes 16m and costs £4 - £6. Alternatively, you can line 563 bus, which costs £3 - £5 and takes 23m. What companies run services between Carrickfergus, Northern Ireland and Newtownabbey, Northern Ireland? Translink UK operates a train from Carrickfergus to Newtownabbey hourly. Tickets cost £4 - £6 and the journey takes 16m. 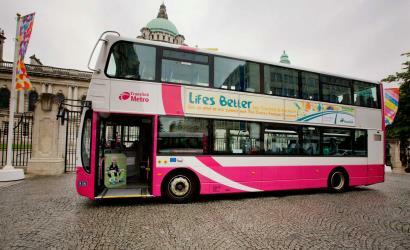 Alternatively, Translink UK operates a bus from Carrickfergus to Newtownabbey hourly. Tickets cost £3 - £5 and the journey takes 23m. Where does the Carrickfergus to Newtownabbey bus arrive? Carrickfergus to Newtownabbey bus services, operated by Translink UK, arrive at Whiteabbey Northern Regional College station. Where does the Carrickfergus to Newtownabbey train arrive? Carrickfergus to Newtownabbey train services, operated by Translink UK, arrive at Whiteabbey station. Can I drive from Carrickfergus to Newtownabbey? Yes, the driving distance between Carrickfergus to Newtownabbey is 6 miles. It takes approximately 9m to drive from Carrickfergus to Newtownabbey. Where can I stay near Newtownabbey? There are 662+ hotels available in Newtownabbey. Prices start at £57 per night. The Ulster Folk and Transport Museum is situated in Cultra, Northern Ireland, about 11 km east of the city of Belfast. It comprises two separate museums, the Folk Museum and the Transport Museum. The Folk Museum endeavours to illustrate the way of life and traditions of the people in Northern Ireland, past and present, while the Transport Museum explores and exhibits methods of transport by land, sea and air, past and present. The museum ranks among Ireland's foremost visitor attractions and is a former Irish Museum of the Year. It is one of four museums included in National Museums Northern Ireland. Queen's University Belfast (informally Queen's or QUB) is a public research university in Belfast, Northern Ireland The university was chartered in 1845, and opened in 1849 as "Queen's College, Belfast", but has roots going back to 1810 and the Royal Belfast Academical Institution. Ulster Hall is a concert hall and grade B1 listed building in Belfast, Northern Ireland. Situated on Bedford Street in Belfast city centre, the hall hosts concerts, classical recitals, craft fairs and political party conferences. Despite the opening of larger concert halls in the city, such as the Waterfront Hall and the Odyssey, the Ulster Hall has remained a very popular venue, and is considered to evoke much more atmosphere than the newer venues. The Shankill Road is one of the main roads leading through west Belfast, the de facto capital of Northern Ireland. It runs through the working-class, predominantly loyalist, area known as the Shankill. Rome2rio makes travelling from Carrickfergus to Newtownabbey easy. Rome2rio is a door-to-door travel information and booking engine, helping you get to and from any location in the world. Find all the transport options for your trip from Carrickfergus to Newtownabbey right here. Rome2rio displays up to date schedules, route maps, journey times and estimated fares from relevant transport operators, ensuring you can make an informed decision about which option will suit you best. Rome2rio also offers online bookings for selected operators, making reservations easy and straightforward.